I read The Diary of Anne Frank when I was a young teenager. That experience would shape and influence the person I became as an adult. The good parts, at least. The thing that fascinated me most about Anne was her unwavering belief that everyone is good at their core. 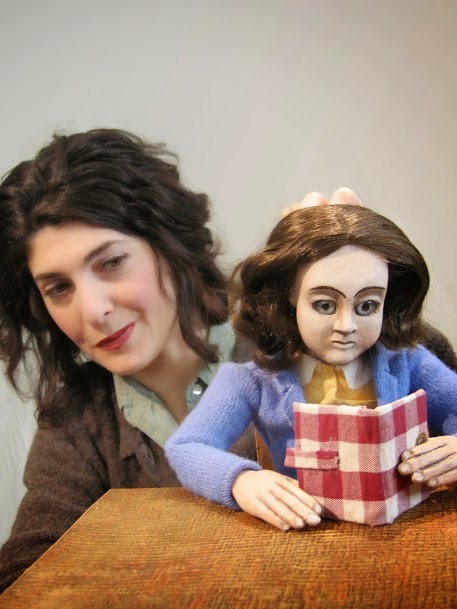 The puppeteers performing Anne Frank: Within and Without, at the Center for Puppetry Arts, shares that fact about Anne brilliantly. This was my first Center for Puppetry Arts performance. I've visited the Center many, many times before and am a lifelong fan of puppetry. Seriously, how could I not be having grown up with Sesame Street, The Muppets and Fraggle Rock! I had never seen a live show there. 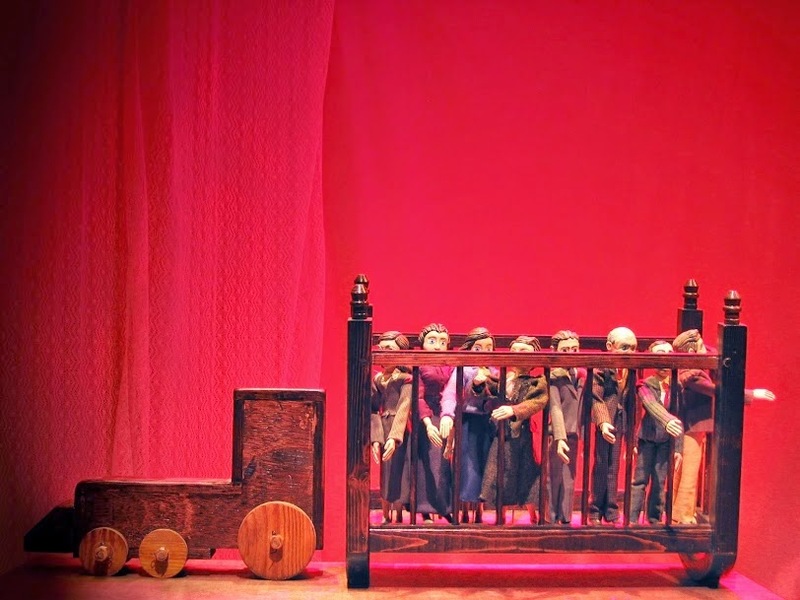 I didn't know what to expect from a puppet theatre, let alone a puppet show about Anne Frank! I was amazed at how incredibly profound it was...how extraordinarily different it was from anything I'd seen before. It was beyond moving. This is the third time this show has been at the Center for Puppetry Arts. This time, the set has been completely changed—the stage now reflects a section of the Secret Annex—and certain puppets have been added. That's to say that if you've seen this show before, when you go again, it'll be different—the set, not the story, of course. The show is an amalgamation of puppetry, acting, music, lighting, and dialogue—both narrative and lines from Anne's diary. If you've ever experienced personal emotions or empathy for the victims of the Holocaust, and their families, those feelings will return when you're watching this show. They did for me. I for one feel strongly that we should retell this and similar stories, to elicit compassion for each other and to inhibit such a gruesome history repeating itself. 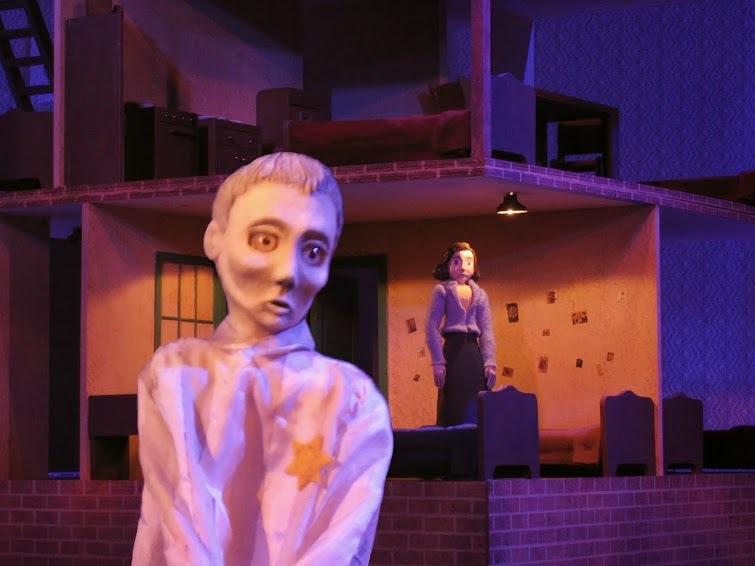 Unlike many other performances of Anne Frank's writings, the Center for Puppetry Arts continues the story after they were taken away and shares with the audience when, where and how seven of the residents of the Secret Annex died, many of them so close to liberation. The only survivor from the Secret Annex was Anne's father, Otto Frank. When he returned to Amsterdam, having survived Auschwitz, which was liberated on January 27, 1945, Miep Gies—a Dutch citizen who hid Anne's family and four others—gave him Anne's diary, a gift he had given her on her 13th birthday...a gift she would give us forever. After reading The Diary of Anne Frank, I would read quite a few Holocaust autobiographies, including Night by Elie Wiesel, who won the 1986 Nobel Peace Prize, and Playing for Time, by Fania Fenelon. It was many years later that I had the great honor of meeting Elie Wiesel in Washington, D.C....a remarkable man! The two puppeteers in the show are Caitlin Roe and Jeffrey Hyman, who are established actors, but to my great astonishment, this was their first time working as puppeteers! Original music was composed and performed by the brilliant and wonderful violinist and composer Chip Epsten. Immediately following the performance, the actors return to the stage for a "talkback". They share a little about their experience performing the show and answer any questions the audience members have. I had questions, but was so emotionally overwhelmed by what I'd just seen I couldn't speak. The story already grips the heart so tightly, and on top of a spectacular and profound performance...I was moved to tears. Written from the perspective of a parent, I invite you to read the review by Lesli of 365 Atlanta Family. Anne Frank: Within and Without, now playing at the Center for Puppetry Arts, is running now through Sunday, March 8. I hope you see it. THANK YOU: Although I've been visiting and writing about the Center for Puppetry Arts for a number of years, I'm grateful to Brave PR and the Center for Puppetry Arts for the complementary ticket to this performance. As always, this posts is my own writing about my personal experience of the show.